a few minutes with some leather dye and a foam paint brush, and the spot disappeared! Thanks for the before and after pictures, Mike! Looks great! Some overzealous scrubbing had scoured off some of the color on this Ford Explorer’s passenger seat. Fortunately, we carry the last for this car’s two-tone seats (Medium Light Stone bolsters with Medium Dark Stone inserts). By the way, this is just after the first coat! The dye was applied using a foam paint sponge. when you order, you'll be prompted to enter your vehicle's VIN # and interior details. 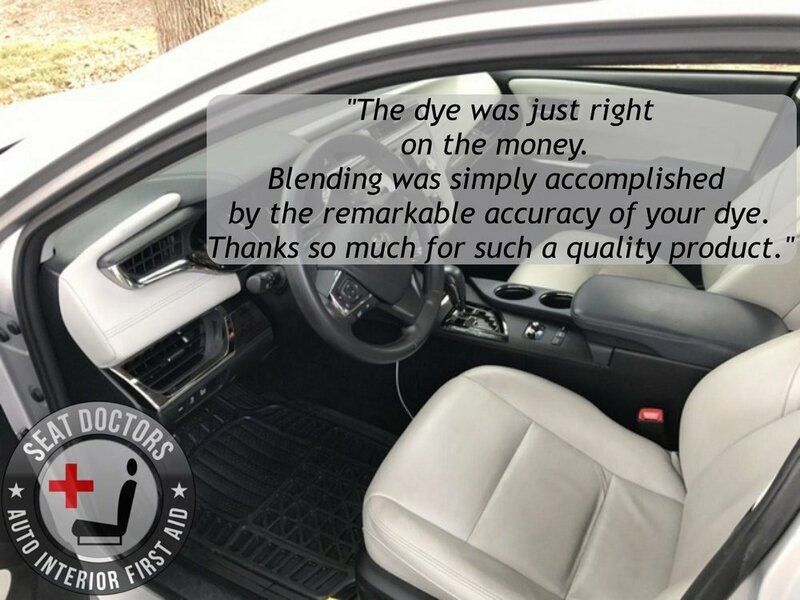 When you order, we'll make sure to get you the exact right dye for your vehicle. Note: Our order page is a little different than others — instead of being forced to pick a color from a chart, fill out the form that pops up when you order with the appropriate information about your vehicle, and we will determine the right dye to send you! The wear was relatively minor, but now the seat looks perfect! 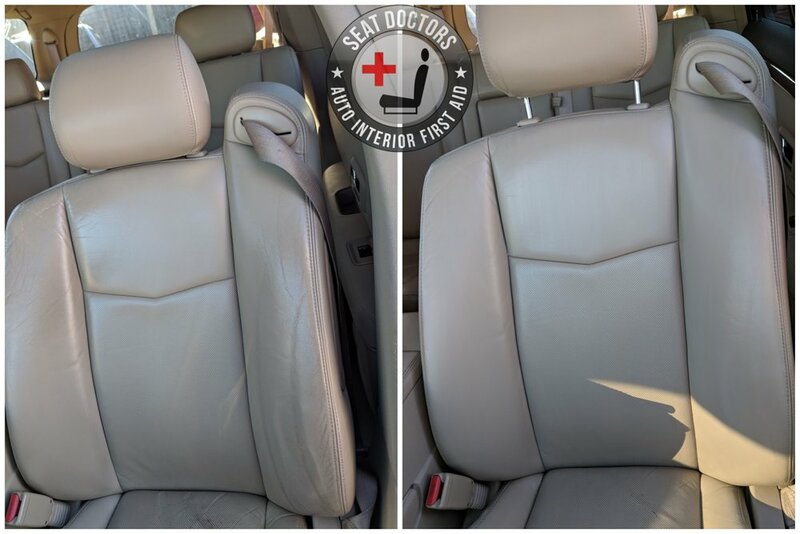 After cleaning the seats, a couple light coats of Light Cashmere dye were applied to the driver’s seat of this 2008 Cadillac SRX. If you’re looking for dye for your Cadillac SRX, or for most other makes and models, you can order here! All we need is the VIN number for the vehicle, along with any available trim codes (for instance, the Service Parts Identification sticker in the glovebox indicated 39i “Light Cashmere), and a description of the color (this can help if the trim code is not available), and we will find the right dye for your vehicle! Another seat that had taken a beating but just needed a little touch up. After cleaning, color was restored using a simple foam paintbrush. Light Cashmere seats were scrubbed with Simple Green and a Scotchbrite pad. Color applied with a foam paintbrush. Here's another good example of how easy fixing some wear on your leather seats can be once you have the right dye -- color was touched up with a simple foam cosmetic wedge. This took only two applications of color to restore the seat. This color is called "Cinnamon Brown." The dye was just right on the money. Blending was simply accomplished by the remarkable accuracy of your dye. Thanks so much for such a quality product. 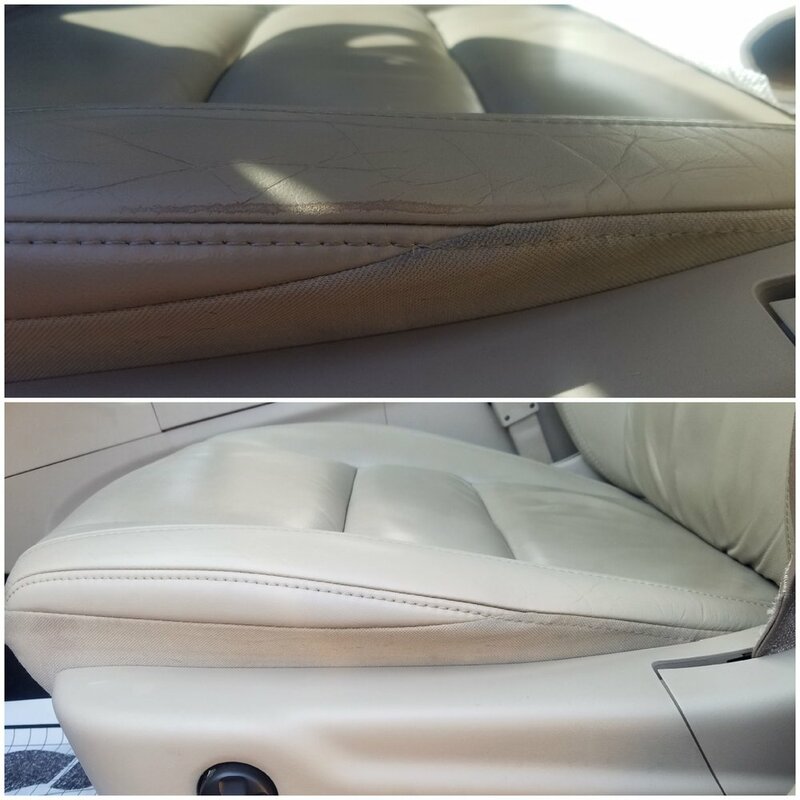 From a happy customer -- "Even though I take care of my vehicle, the seats just shown excessive wear. Your product has them looking like they are brand new. Pictures do not the seats justice." A customer sent this in -- they had an ink stain that they tried to pull up with a Magic Eraser, but got to the rawhide before they could eliminate the stain. 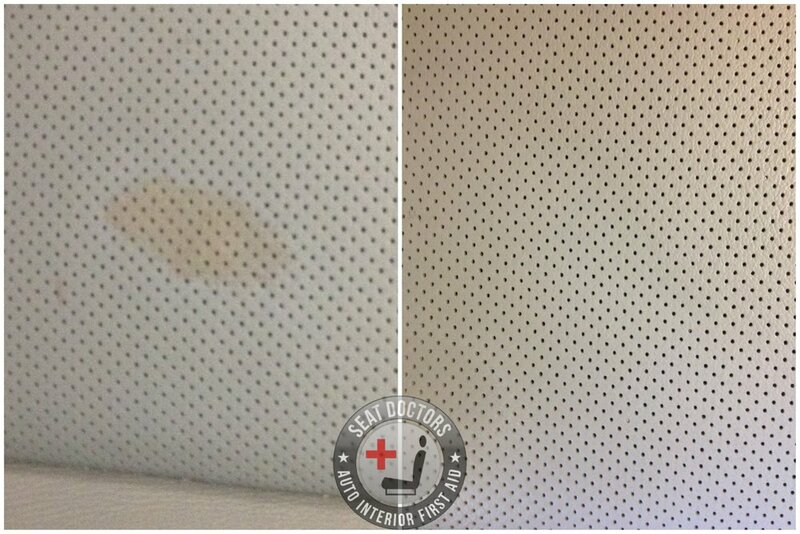 Fortunately, they were able to get matching Parchment leather dye for their Lexus RX350 and touched up the spot perfectly. Good as new! CLICK HERE if you're looking for leather dye for your Lexus, or almost any other make and model! Believe it or not, this is the same seat. 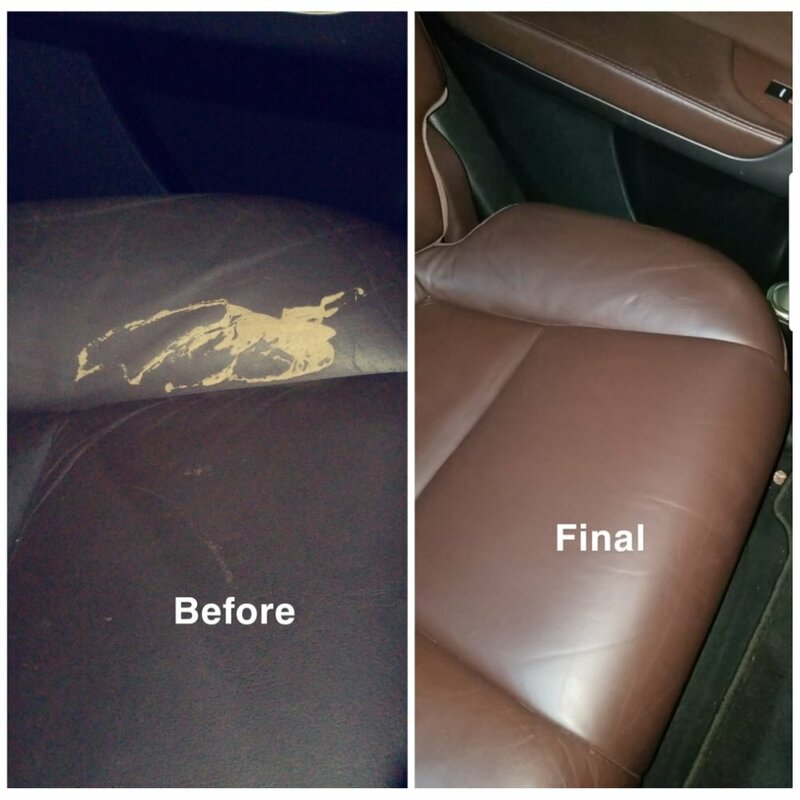 The owner had thought that his seats had been ruined after cleaning chemicals were spilled on the leather. He was able to bring it back to perfection with some new Silverstone II leather dye. As a note for other BMW owners with Silverstone leather -- you've probably tried to find Silverstone II dye but been frustrated when the dye was too dark. There's a huge difference between Silverstone and Silverstone II. If you need the right color for your BMW, order from Seat Doctors. BMW leather colors can be a challenge, but we're up to the task. CLICK HERE to order leather dye for your BMW! a little bit of matching Light Frost Beige dye was used to touch up the wear along the seam of the lower bolster, as well as the discoloration on the cloth on the side. Good as new, and took about 15 minutes, start to finish. This repair was performed with a foam paint brush.